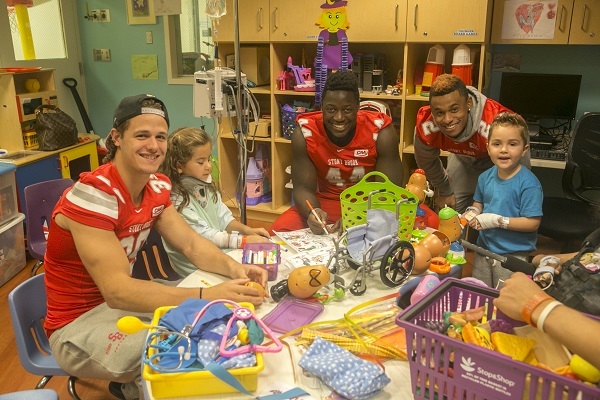 It was hard to tell who was having more fun on Wednesday, October 29, in the play room at Stony Brook Children’s Hospital, the kids or the football players from Stony Brook University. (left to right) Defensive Back Christian Ricard, of Spencer, Mass. (#39), 6-year-old Liliana Virgilio of Smithtown, Tight End Will Tye of Middletown, Conn. (#44), Defensive Back Davonte Anderson of Corona, Calif. (#2) and 4-year-old Julien Indefonso of Holbrook. STONY BROOK, N.Y., October 30, 2014 – Just in time for Halloween, members of the Stony Brook University Football team took some time off the field yesterday to lift the spirits of the young patients at Stony Brook Children’s Hospital. After an early morning practice, the players – including Running Back Stacey Bedell of Mastic Beach, NY (#21); Tight End Will Tye of Middletown, Conn. (#44); Kicker/Punter Luke Allen of Port Jefferson, NY (#53); Quarterback Conor Bednarski of South Pasadena, Calif. (#16); Defensive Back Christian Ricard, of Spencer, Mass. 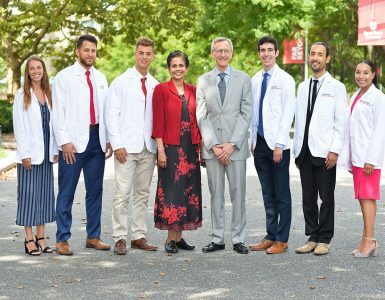 (#39); and Defensive Back Davonte Anderson of Corona, Calif. (#2) – picked up Wolfie Seawolf, the official mascot of the Stony Brook University Seawolves, and mingled with some of the youngest Seawolves fans in the pediatric acute care units and the pediatric hematology/oncology unit at Stony Brook Children’s. With ‘tricks and treats’ in hand, the players drew and colored Halloween-inspired pictures and crafts with the children, took photos, gave out temporary Wolfie tattoos, signed autographs and had some fun with the kids in the Child Life playroom. The visit brought exactly what they hoped for, smiling young faces. And based on the players’ smiling faces it was difficult to tell, who was having more fun.